CSA 6, 5¢ blue pair tied pen with manuscript of Fountain Inn [SC]) on homemade cover to Carnsville, Georgia, Rarity 7 town, signed on verso by Green and Kimbrough, Ex Wm. A. Fox. 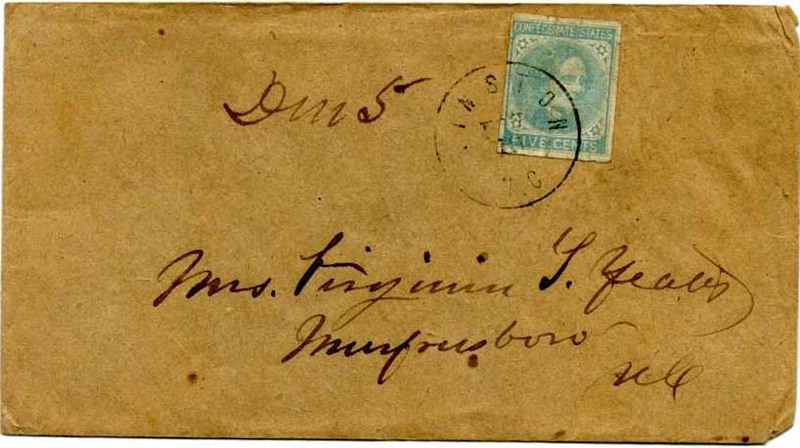 CSA 6, 5¢ blue single, faulty, tied neat blue PETERSBURG / Va.  cds on pristine pink lined ladies cover to “Mr. 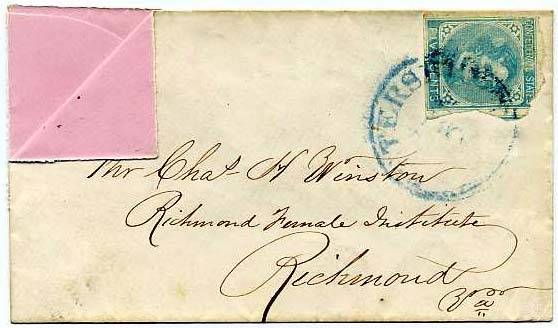 Chas H. Winston (President of) Richmond Female Institute, Richmond, Va.”, Ex-Tobias, Single uses are much scarcer than pairs. $170. 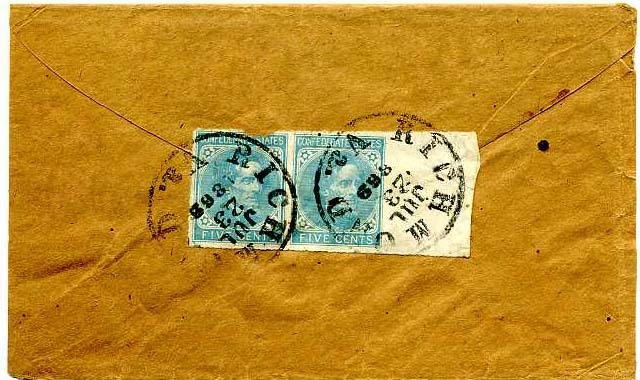 CSA 6, 5¢ blue single, 4-margin, tied neat blue PETERSBURG / Va. // MAY / 9  cds on pristine homemade cover to Pleasant Grove, Va; used before the rate change to 10-cents; Single uses are much scarcer than pairs. Ex Tobias. 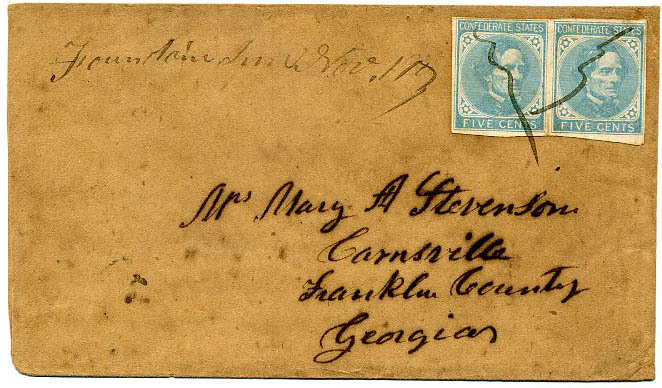 CSA 6, 5¢ blue, two singles tied in opposite top corner of pristine homemade cover by neat AUGUSTA / GA. // AUG / 1 double circle cancels addressed to “Mrs. 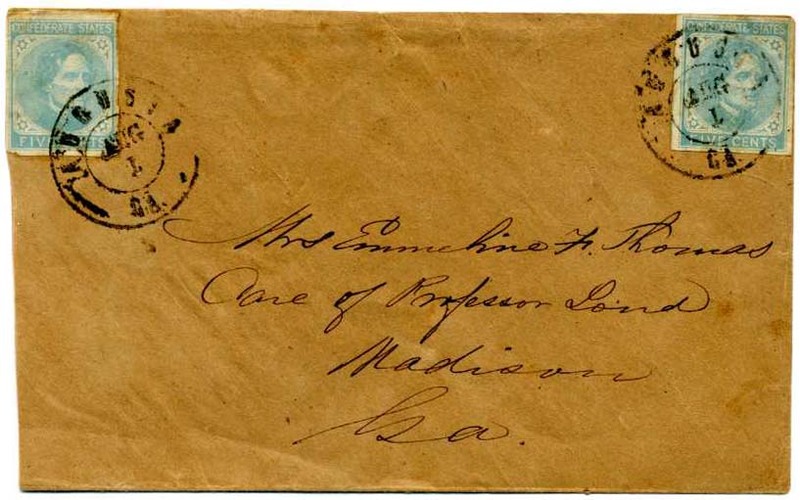 Emmeline F. Thomas Care of Professor Land, Madison, Ga.”, sealed flap tear, Most appealing. 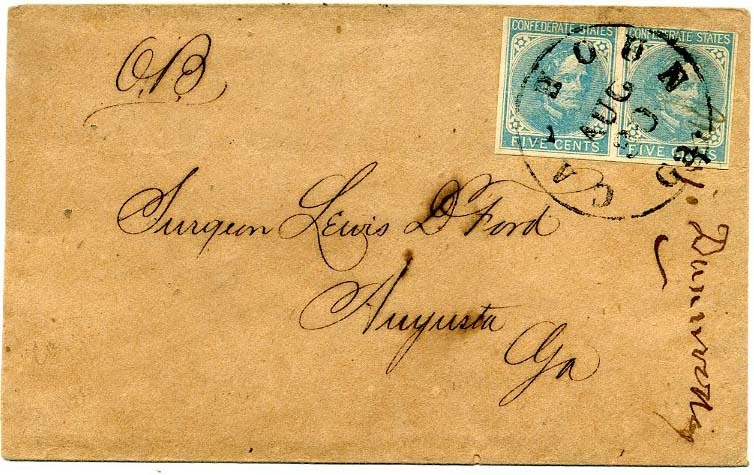 CSA 6, 5¢ blue pair with large to huge margins all around, neat neat AUGUSTA / GA. // JUL double circle cancel on fresh homemade cover to “Mr. 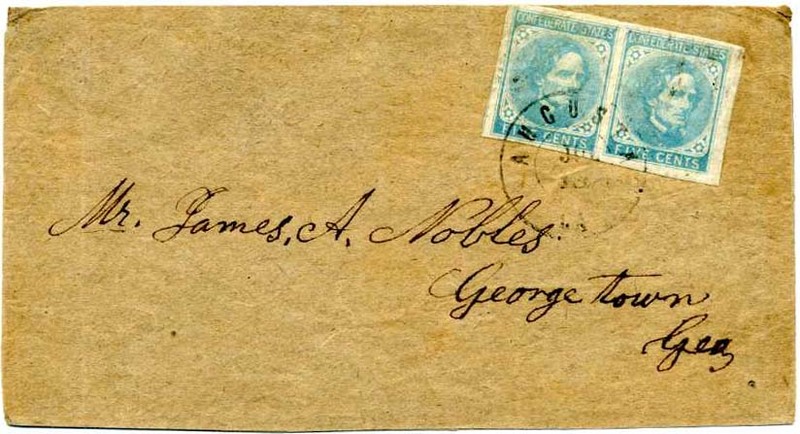 James A. Nobles, Georgetown, Geo., slightly reduced at bottom otherwise Very Fine, Choice. 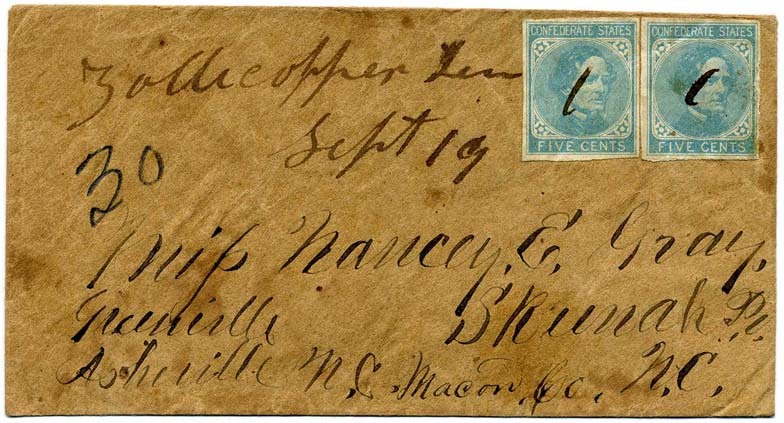 CSA 6, 5¢ blue single tied neat blue DUBLIN / VA // JUL / 10 (1862) thus underpaid as the rate went to a universal 10¢ on July 1, 1862 addressed to “G.A. Myers Esq, Richmond, Va.” on turned cover. Myers was a lawyer and the most prominent member of the Jewish community in Richmond with an illustrious career. Inside use hand carried to “Mr. Albert Gibson, Private “Clerk for Gen(eral Henry) Heth, Camp Success”, bit reduced at top. Educated at West Point, CSA Maj. Gen. Henry Heth was a key player in the war. Single uses are much scarcer than pairs. CSA 6, 5¢ blue single tied neatly struck WELDON / N.C. cds on homemade cover to “Mrs. E. J. Harding Care of Mrs. C. H. Richmond, Milton, N. C.” Single uses are much scarcer than pairs. $200. CSA 6, two pair of 5¢ blue tied by bold double strike of RICHMOND / Va. // JUL / 25 / 1862 cds on legal size cover reduced at left, addressed to Rev James A Lyon DD, Columbus, Miss; adversity cover fashioned from lined medical military form showing “Assistant Surgeon / Commanding Officer…are necessary for the use of the sick at this post, in consequence of…”, open 3 sides to display, bit of edge wear. Nice double rate adversity use. Ex Hambrecht. $450. 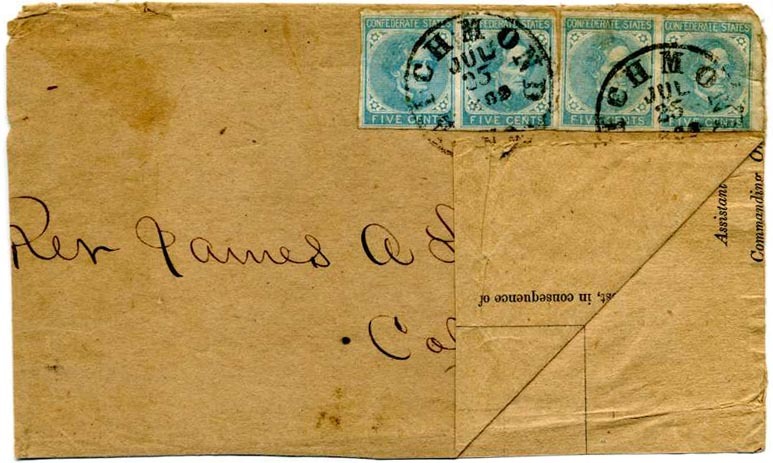 CSA 6, 5¢ blue single tied neat MARION C. H. / S.C. // MAY / 21  CDS on cover to “Col. 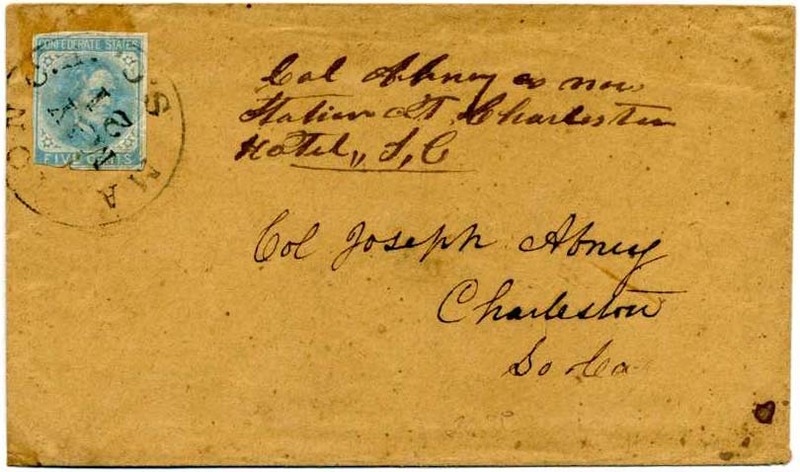 Joseph Abney, Charleston, So.Ca.” with notation that “Col. Abney is now stationed at Charleston Hotel, S.C.”, Ex Dietz and Bogg. Officer bio accompanies: enlisted as a captain and rose to Colonel (22nd SC Infantry, 1st Battalion SC Sharpshooters and 27th SC Infantry). Wounded at Drewry’s Bluff and died in 1870 as a direct result of his wounds. Single uses are much scarcer than pairs. $250. 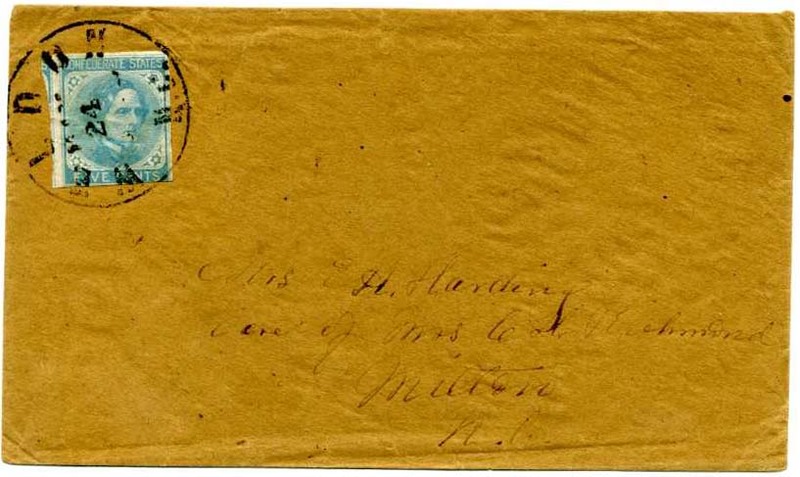 CSA 6, 5¢ blue single (small faults) tied KINSTON / N.C. // NOV / 18 cds with manuscript “Due 5” for underpayment of postage on clean homemade cover to Mrs. Virginia Yeates, Murfreesboro, NC. Single uses are much scarcer than pairs. $150. 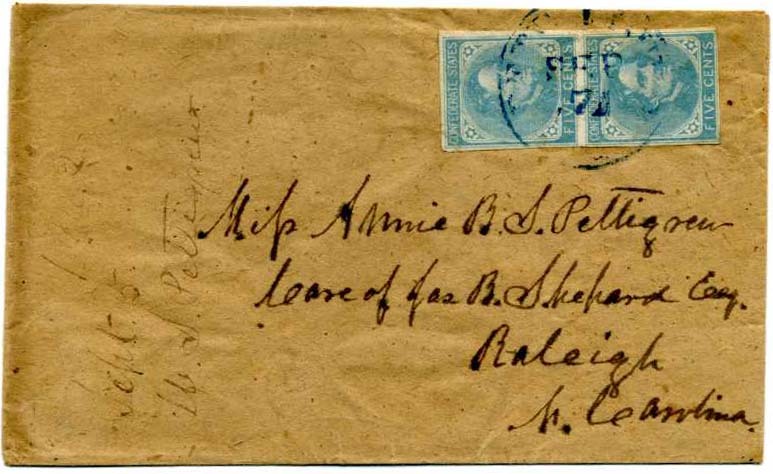 CSA 6, 5¢ blue vertical pair tied neat blue PETERSBURG / Va. // SEP / 7 cds on homemade cover to Miss Annie B. S. Pettigrew, Care of Jas. B. Shephard Esq., Raleigh, N. Carolina; Fine. $120. 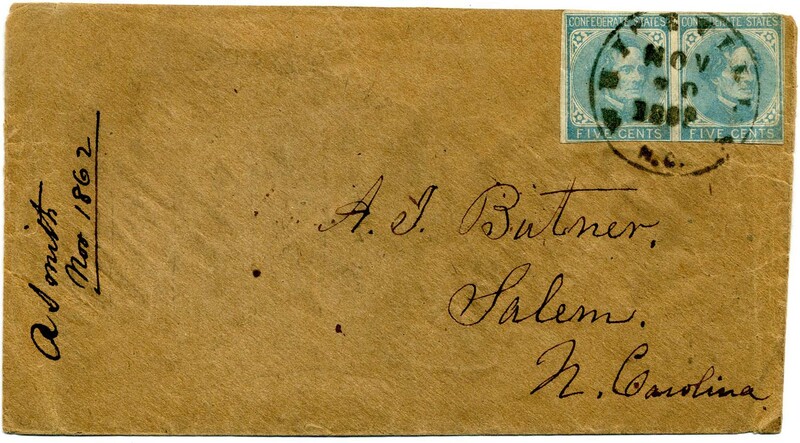 CSA 6, 5¢ blue single tied neat WILMINGTON [NC] // JUN 4  on cover to Miss L. C. McGimsey, Linville River, Burke County, N.C.; Very Fine. Singles used are much scarcer than pairs due to universal rate change July 1, 1862. $200. 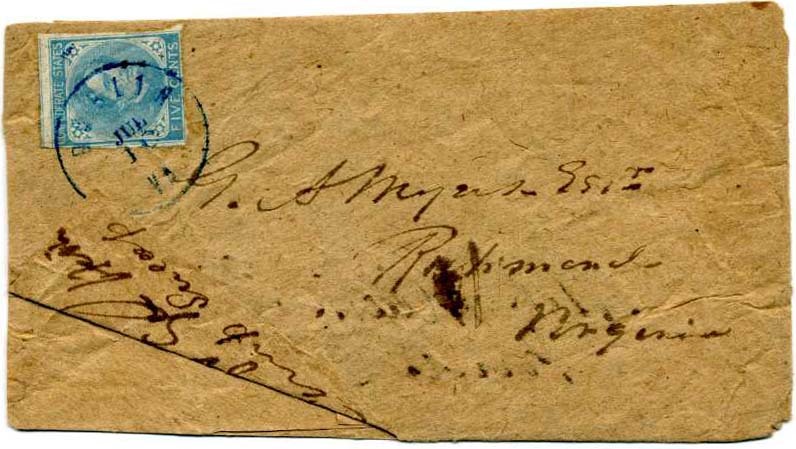 CSA 6, 5¢ blue single tied bold neat RICHMOND / Va. // MAY / 28 / 1862 cds at left side on small cover to Mrs. J. C. McLure, Care of Col. Dawkins, Mianville, S.C. J. William McLure was the Asst. QM of Co. M in the Palmetto Sharpshooters, Anderson’s, Jenkins Brigade, Army of Northern Virginia. $200. 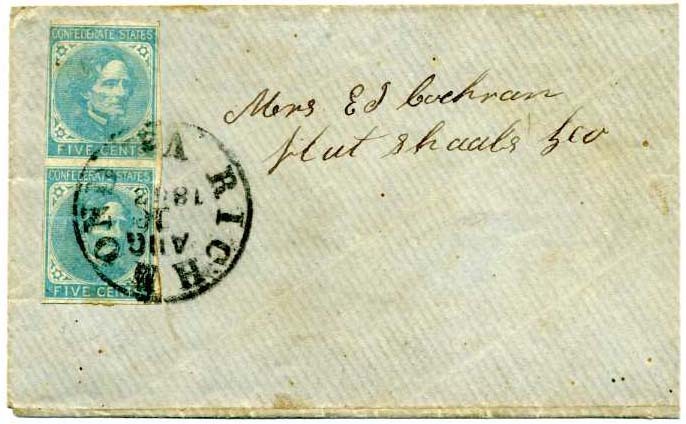 CSA 6, 5¢ blue, two singles (slight edge erosion on right of right stamp) used with manuscript cancel of Zollicoffer, Ten Sept 19 on homemade cover to “Miss Nancy E. Gray, Skeenah PO NC” and at left “Greenville Asheville N.C. Macon Co.” in same hand. The town of Union was renamed Zollicoffer during the Civil War in honor of Confederate General Felix Zollicoffer who was killed in battle on January 19, 1862 at Mills Springs KY. It reverted to the name Union after the war until 1887 before incorporating under the present name of Bluff City. Scarce town marking. $300. 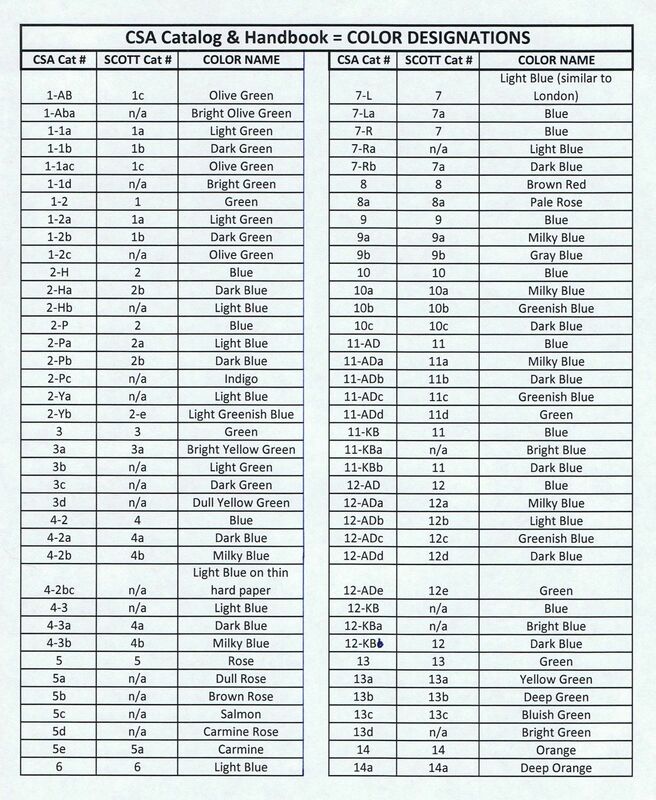 CSA 6, 5¢ blue pair (4 margins) tied HAZLEHURST / Miss. 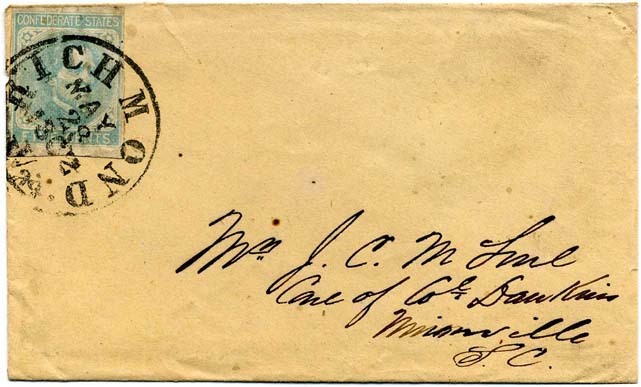 // MAR / 13 / 1863 cds on clean folded letter to Miss Sophia Jelks, Care of Lewis Doyle Esq, Jackson, La. 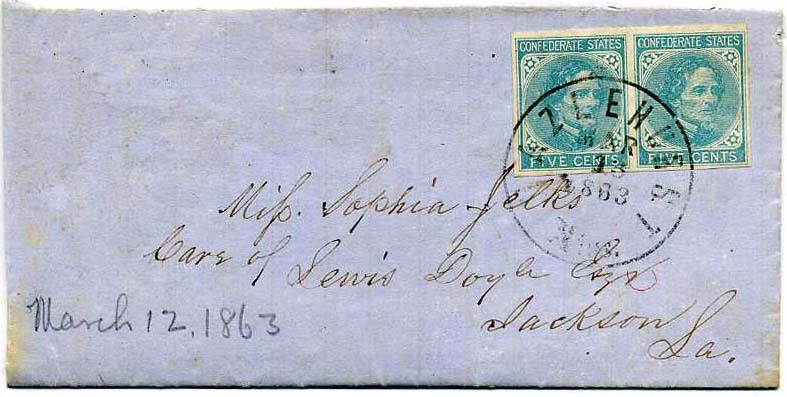 from W. A. Stockton, small vermin hole in letter and letter refolded, Ex Hall $160. 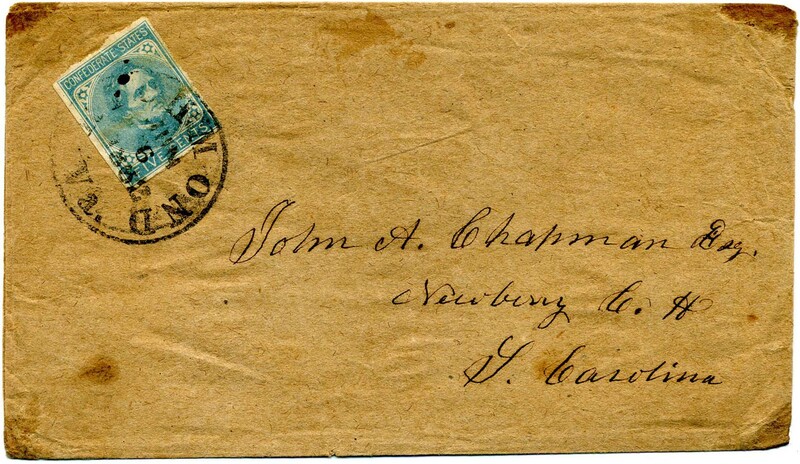 CSA 6, 5¢ blue pair tied bold CALHOUN / Ga. // AUG / 30 cds on homemade cover noted “O.B.” (Official Business) to Surgeon Lewis D. Ford, Augusta, Ga. with contents docketing as being from Maj. Dunwoody. Extremely long detailed Hambrecht / Koste biography of Dr. Lewis DeSaussure Ford at http://www.findagrave.com/cgi-bin/fg.cgi?page=gr&GRid=122014237 with photos. During the Civil War, Ford “was first surgeon of the Georgia Hospital in Richmond to the close of the war. When called on in 1862, he unhesitatingly journeyed to the Confederate capital, though then sixty years of age." $180. CSA 6, 5¢ blue London bottom sheet margin (scuff in margin) and CSA 7-L, 5¢ local print (pre-use crease) on London paper tied together with CHARLESTON / S.C. // AUG / 11 / 186 cds on homemade cover to Miss Virginia C. Willis, No. 7 Line Street, Charleston, So Ca. and Care of W. S. Henry, Esq., 318 Meeting St. Although there is no absolute proof this was delivered by PENNY POST, both street addresses are local and more likely than not it was delivered that way. 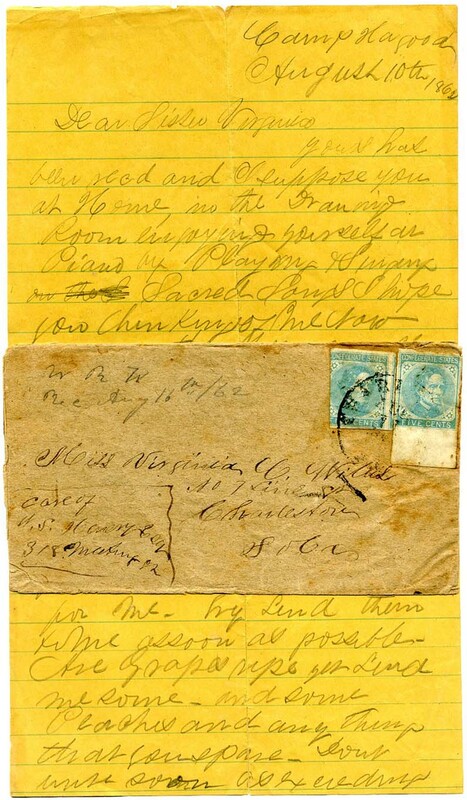 Original letter headed Camp Hagood, August 10th, 1862 from W. R. Willis to his sister with rather ordinary content. Letter file splits reinforced with archival tape. There are two listings for W. R. Willis, one in SC Washington Light Artillery and the other in SC 2nd Battn Sharp Shooters. Penny Post use catalogs $3,500 in CSA Catalog for local delivery. Ex Karrer. $350. 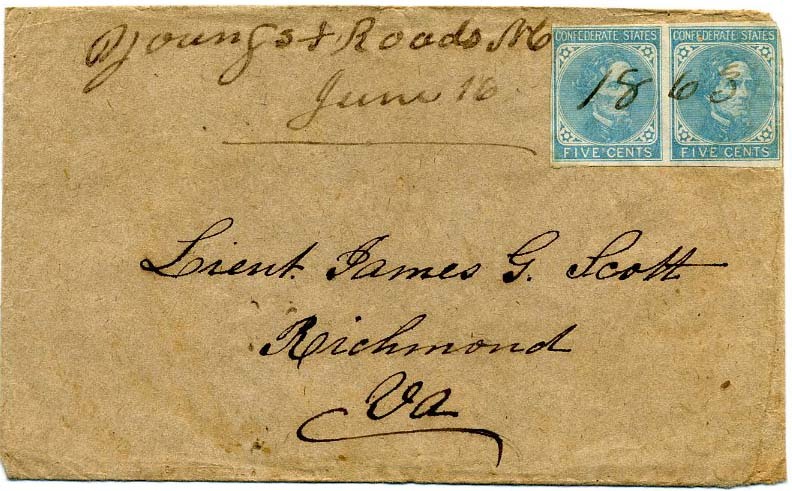 CSA 6, 5¢ light blue pair (tiny erosion hole in right stamps) used with manuscript “Young’s X Roads NC / June 16 1863” on homemade cover to Lieut. James G. Scott, Richmond, Va, with interesting notes on verso. Scarce small town cancel and interesting backstory. $100. James G. Scott enlisted 9-19-62 from Granville County, NC, as a 2nd Lieutenant, commissioned into Co. D, NC 1st Infantry, Ripley’s Brigade, D.H. Hill’s Division, 2nd Corps, Army of Northern Virginia. More info included on linked page. 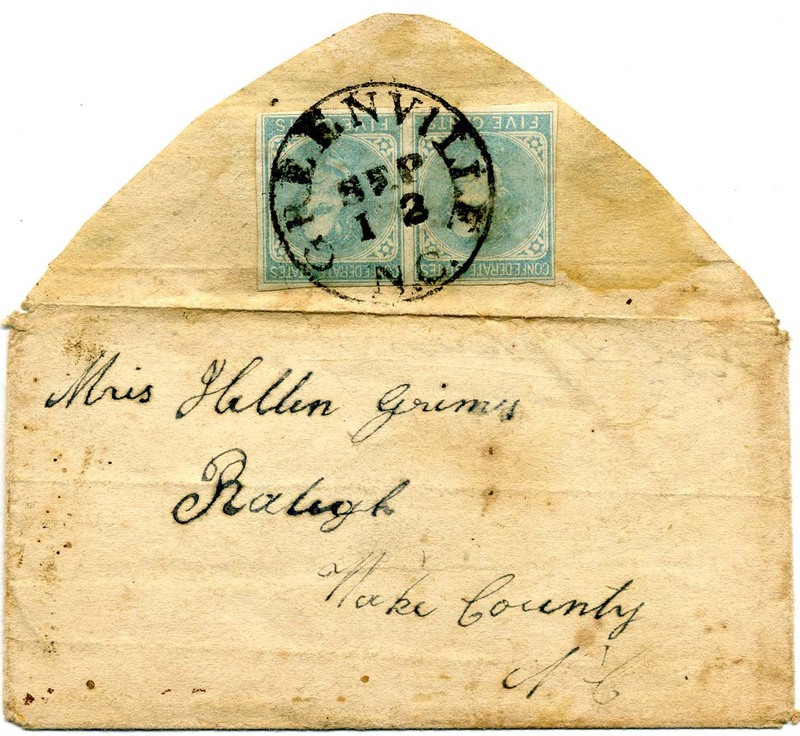 CSA 6, 5¢ light blue pair tied GREENVILLE / N.C. // SEP / 13 cds on back flaps of small homemade cover to Hellen Grimes, Raleigh, NC. 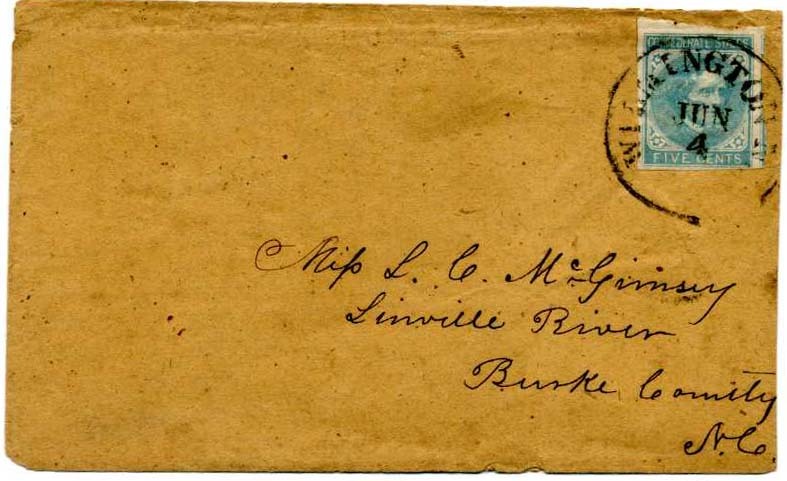 Inside with a handwritten name but no address or evidence of postal use, light staining mostly on back. $100. CSA 6, 5¢ light blue single tied RICHMOND / Va. // JUN / 6 / 1862 cds on homemade cover to John A. Chapman, Esq, Newberry C.H., S. Carolina. Singles uses are scarcer than pairs. Ex Wayman. SCV $150. $110. 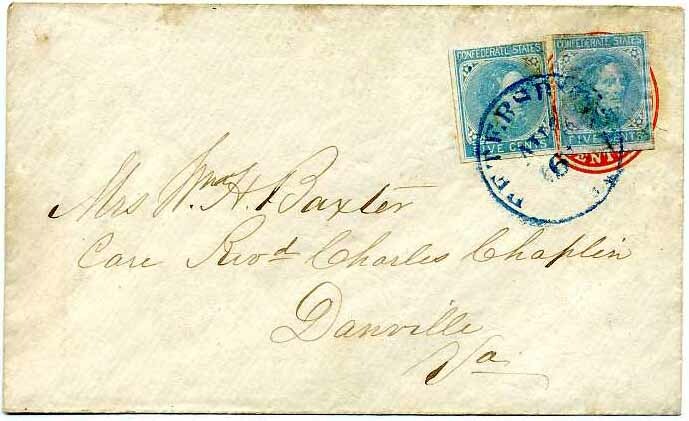 CSA 6, 5¢ light blue pair tied neat bold WHITEVILLE / N.C. // NOV / 10 / 1862 cds on cover to A. H. Butner, Salem, N. Carolina, top back flap missing. 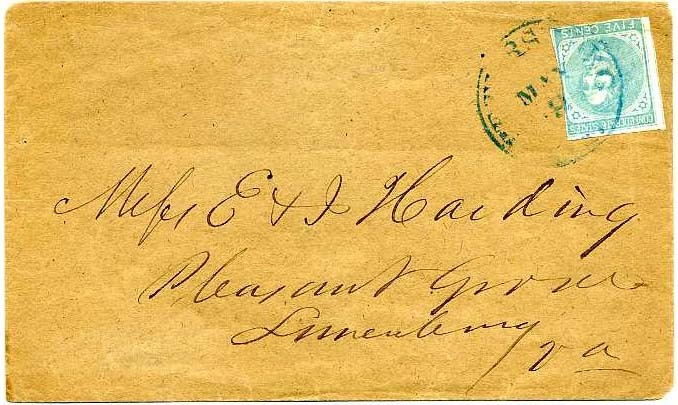 Scarce cancel on Very Fine cover. Salem Tavern, now restored, used to be called the Butner Hotel. $150.